TENMOS X96 Wireless Rechargeable Gaming Mouse USB Optical LED Silent Computer Mouse Compatible with Laptop/PC/Notebook, 3 Adjustable DPI, 6 Buttons (Black) by TENMOS at Kool Heads. MPN: MY090901. Hurry! Limited time offer. Offer valid only while supplies last. Key points 1. Built-in rechargeable li-battery, no need to change batteries. Charges while playing games over a single standard micro USB cable. 2. 1. Built-in rechargeable li-battery, no need to change batteries. Charges while playing games over a single standard micro USB cable. 2. Ultra long-distance(up to 10 meters) wireless transmission. Ultra long-distance wireless transmission, with maximum acceleration of 20G. 3. Special soundless design for the left and right buttons, you can use it in your office to build a quiet office atmosphere. 4. Fits naturally in your hand with no cramping after extended gaming or work sessions. 1. Charge the mouse for about 2 hours before using it for the first time. 2. Take the dongle out, which is underneath the mouse. 3. Insert the dongle into the USB port of your PC. 4. Turn on the mouse, the switch is at the bottom of the mouse. 5. Allow a few seconds for installing, no action needed, just wait. Then you can use the mouse. 1. It's out of power if the mouse pointer moves slowly or stop moving. The blue light beside the scroll wheel will be on while charging, and then goes off when the mouse is fully charged. 2. If you do not use the mouse, switch it to "Off". Switch the light on if you need the LED lights up. 3.Make sure to turn on the mouse when you charge it. 4. This is a rechargeable mouse. DO NOT change battery. Common AAA or AA battery does not work for TENMOS rechargeable mouse. 5. If you get any problems, please feel free to contact TENMOS Customer Service. 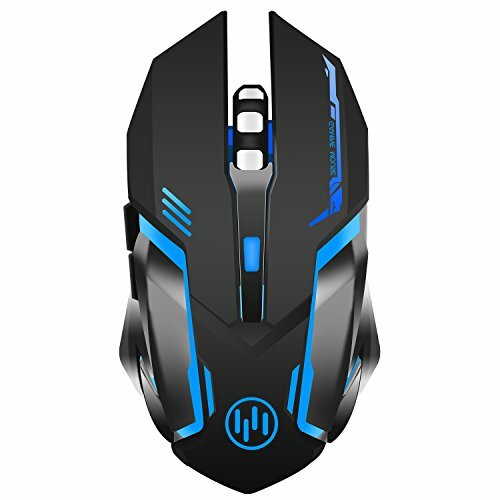 POWER SAVING MODE:The mouse will keep automatically sleeping for over 8 minutes, it will turn to power saving mode to save energy, light will auto off at same time. LED LIGHT-UP FEATURE: 7 soothing LED colors change alternately, cannot be set to one specific color, it can't be turned off. ADJUSTABLE DPI: 800/1600/2400 DPI free switch. Dots per inch (DPI) is a measurement of how sensitive a mouse is. The higher DPI, the farther the cursor on your screen will move when you move the mouse. If you have any questions about this product by TENMOS, contact us by completing and submitting the form below. If you are looking for a specif part number, please include it with your message.